Tables are in the store, come in and take a look. Please call The SewNSew if you have questions: (626) 852 – 2223. Comes in 8 different elegant finishes, rounded corners and beveled edges. Top quality hardware for hinges to sleek handles, store away work surface neatly when not in use, three adjustable shelves for storage and display. LED lighting, and smooth-rolling and lockable casters. Comes in 8 different beautiful finishes, electric glide lift with wireless remote and runs on a dual steel trach. Two adjustable shelves, smooth-rolling and lockable casters. Quality hardware from higes to sleek drawer pulls, the when closed the Cub Plus IV is 35 1 /4 inches wide, 22 1 /2 inches deep, and 29 1 /4 inches high. With the outback leaf adds another 23 3 /4 inches to the deep for 22 1 /2 inches. Comes in 8 different beautiful finishes, all beveled edges and no exposed hinges. Optional second ties and optional bi-fold doors. With 8 different beautiful finishes and two Electric Glide Lifts with wireless remotes. Both lifts run on a dual steel track. Two adjustable shelves are centrally located and perfect for holding the storage. Top quality hardware from hinges to sleek drawer pulls. 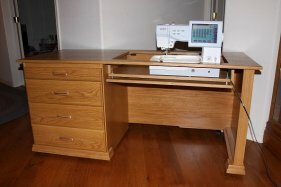 embroidery machines with extra-deep, full extension drawers. Three adjustable shelves, and embroidery frame glide provides easy hoop and notion trap access. 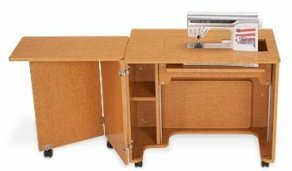 Comes in 8 different beautiful finishes, three adjustable shelves for many different items with all edges beveled so no exposed hinges to snag fabric, and an extra-deep, full extension drawer with special soft-closing features. Designed footprint for Baby Lock and Brother multi-needle embroidery machines. The entire cabinet closes for easy storage. Comes in 8 different beautiful finishes, side extensions for an overall width of 123 inches from left to right. Doors open and folded flat against the sides, and two side extensions, included with cabinet to offer over 1 dozen configurations. Comes in 8 different beautiful finishes, two adjustable shelves perfect holding storage boxes, books, and or cutting mats. Top quality hardware from hinges to sleek drawer pulls. Comes in 8 different beautiful finishes, top quality hardware form hinges to sleek drawer pulls, smooth-rolling and lockable casters. 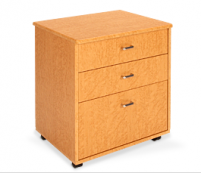 Three full extension drawers that are extra wide, with the bottom drawer extra deep, special soft-close drawer features, and heavy duty drawer glides rated to hold 120 pounds. When closed, it is compact with 27 7/8 inches wide, 20 7/8 inches deep, and 29 1 /4 inches high. Two side extensions included with the cabinet, which offers over 1 dozen configurations. 8 different beautiful finishes and electric glide lift with wireless remote, and runs on a dual steel track. Two adjustable shelves perfect holding the storage boxes, books and or cutting mats. Comes in 8 different beautiful finishes, top quality hardware from hinges to sleek drawer pulls, two adjustable shelves for holding storage, six full extension drawers with three regular and three extra wide. 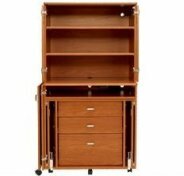 Rounded corners and beveled edges, top quality hardware from hinges to sleek handles, 2 adjustable shelves, and full-extension, generous drawers that are rated to 120 pounds with soft-close features. Comes in 8 different beautiful finishes, each created through a proprietary process that makes it tougher against scuffs and scratches. 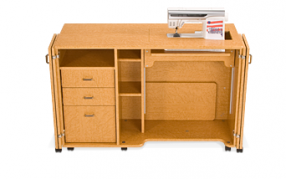 Two side extensions, included with cabinet this offers over 1 dozen configurations. 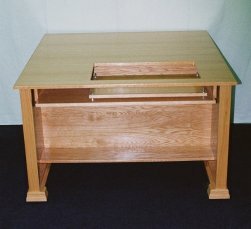 8 different beautiful finishes and three full extension drawers with one bottom extra deep. Comes in 8 different elegant finishes, rounded corners and beveled edges, five full-extension drawers in three generous sizes, with soft-close features makes the impossible to slam, and the drawer glides are rated to 120 pounds. The compact is perfect for a small space, and or for a second or third machine. It comes with heavy-duty 3-position machine lift platform and the lift opening measures 18 7/8 inches wide by 11 1 /4 inches deep. It also comes with removable accessory and notion trays. Comes with storage boxes, removable trays, and removable fabric bins. 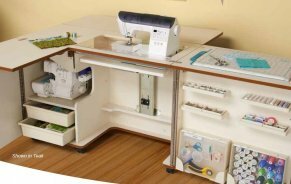 The work surface can expand as need with plenty of storage space for a second machine. The platform is supported with a heavy-duty, 3-position machine lift platform, and touch release airlift. Easy-roll, lockable casters, and fully opened is 70 1 /4 inches wide, 53 3 /4 inches deep, and 29 1 /2 high. Comes with an extra-large surface area for large projects and largest 3-position machine lift platform. The lift opening measures 24 1 /4 inches wide by 12 5/8 inches deep. Each extension works independently and can be positioned as needed. Comes in solid wood trimmed with 5/8 inch white Melamine top surface, one drawer, and full 2 inch brass piano hings. On twin whell plate casters. 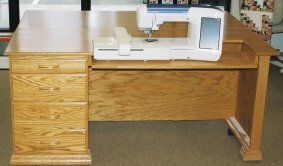 Has a 48 inches by 48 inches sewing and quilting surface and when closes is 25 inches by 48 inches. There is a 21 inches deep cabinet, dual leg supported leaf, full 2 inches piano hinged leaf, and full Embroidery cut out, (all cut outs available). Comes on twin wheel plate casters. 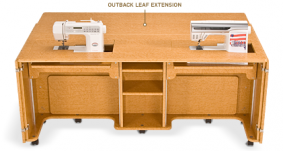 Is 27 inches by 65 inches Sewing and Quilting veneer work surface and 48 inches by 65 inches Work surface with the rear leaf. 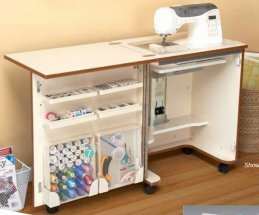 On twin wheel plate casters, drop down platform system, and a storage drawer for an Embroidery module. Is 24 inches by 65 inches Sewing and Quilting with veneer work Surface, and 48 inches by 65 inches work surface with rear leaf. 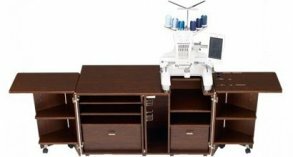 Drop down platform system, storage drawer for embroidery module, front load bobbin access, compact design for a longarm Sewing Machine, and is on twin wheel plate casters. 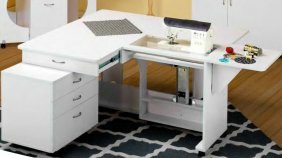 Has a 24 inches by 65 inches Sewing and Quilting veneer work surface, and 48 inches by 65 inches work surface with the rear leaf. Drop down platform, on twin wheel plate casters, and designed for the Brother 6000 and the Baby Lock Ellisimo. Has a 24 inches by 65 inches top, height of 31 1 /2 inches with casters, weight 95 pounds and no assemble required.